As a heavy user of Nautilus and Filebot, i decided to integrate the two. Following on from my previous article on column providers for nautilus, here as the additional functionality for nautilus filebot integration. Its a basic threaded extension; for the most basic and most used operation, “Strict file renaming”. Below is an example of a python column provider for nautilus. 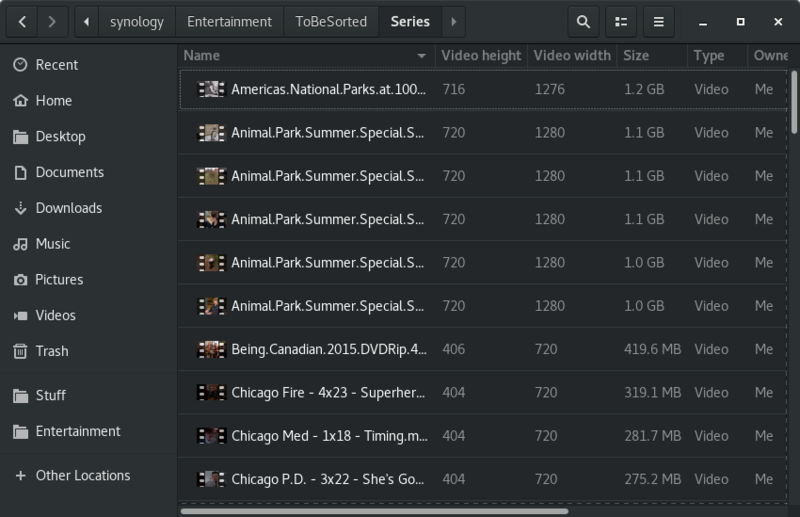 Identifying poor quality video files 480p, 720p … is difficult in nautilus at a glance. You need to open the file properties to view the video metadata. While there are a number of extensions out there for EXIF etc, i decided to implement my own. Originally i tried to use MediaInfo, but it was far too slow. This is what i ended up with. To activate it, just login and logout, or kill nautilus and restart it. This application is a port of my C# application called localmini. This is my first program in PyGTK. This upload option i hope to add to the nautaulis context menu also. screenshots to localhostr.com, email link functions and hotkeys, hotcorner and other functionailty. Basic functionality is there, preferences dialog is basically a shell, awaiting link up to the underlying classes.